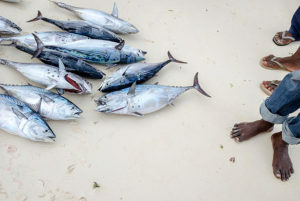 In collaboration with the United Nations Food & Agriculture Organization (FAO), the DLMtool team has created a four-day workshop series to provide support to managers of tuna stocks inhabiting areas beyond national jurisdictions (high seas fisheries). The purpose of the course is to train fisheries managers in the concepts of management strategy evaluation and to provide tools to support the selection of data-limited approaches for managing tuna, billfish and shark fisheries on the high seas. The training is directed at fisheries scientists tasked with interpreting fishery data and making management recommendations. The first of a series of courses was delivered to the Indian Ocean Tuna Commission in Mahe, Seychelles in May of 2017 (see the workshop agenda). A similar workshop will take place later in 2017 in Argentina, designed for Argentine and Uruguayan fisheries. Other proposed workshops are planned for 2018 at the Inter-American Tropical Tuna Commission (IATTC) and the International Commission for the Conservation of Atlantic Tunas (ICCAT). Each training includes two case studies specific to each regional fishery management organization.